Transistors can be categorized according to their structure, and two of the more commonly known transistor structures, are the BJT and FET. BJT, or Bipolar Junction Transistor, was the first kind to be commercially mass-produced. BJTs conduct using both minority and majority carriers, and its three terminals have corresponding names ‘“ the base, emitter, and collector. It basically consists of two P-N junctions – the base-collector and the base-emitter junctions. A material called the base region, which is a thin intervening semiconductor, separates these two junctions. Bipolar Junction Transistors are extensively useful in amplifying devices, because collector and emitter currents are effectively controlled by the small current at the base. They are named as such, because the current which is controlled, goes through two types of semi-conductor materials ‘“ the P and N. Current, essentially, consists of both hole and electron flow, in separate parts of the bipolar transistor. BJTs basically function as regulators of currents. A small current is regulating a larger current. However, for them to properly operate as current regulators, the base currents and the collector currents must be moving in the right directions. FET, or Field-effect Transistor, also controls the current between two points, but it uses a different method to the BJT. As the name suggests, FETs’ function is dependent on the effects of electric fields, and on the flow, or movement, of electrons in the course of a particular type of semi-conductor material. FETs are sometimes referred to as unipolar transistors, based on this fact. FET uses either holes (P channel), or electrons (N channel), for conduction, and it has three terminals – source, drain, and gate – with the body connected to the source in most cases. In many applications, FET is basically a voltage controlled device, due to the fact that its output attributes are established by the field that is dependent on the applied voltage. 1. The BJT is a current-controlled device since its output is determined on the input current, while FET is considered as a voltage-controlled device, because it depends on the field effect of the applied voltage. 2. The BJT (Bipolar Junction Transistor) uses both the minority and majority carriers (holes and electrons), while FETs, which are sometimes called unipolar transistors, uses either holes or electrons for conduction. 3. 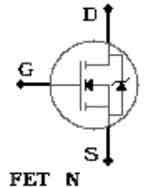 BJT’s three terminals are named the base, emitter, and collector, while FET’s are named the source, drain, and gate. 4. BJTs are the first type to be commercially massed produced. Ian. "Difference Between BJT and FET." DifferenceBetween.net. January 28, 2010 < http://www.differencebetween.net/technology/difference-between-bjt-and-fet/ >. Tanx , for the tutorial …. i thnk you should described it by table form..!! Good your job sir. we grateful for this kind of ur opinion…..